Residents are invited to learn about what’s next for Riverfront Fort Wayne during a public meeting set for Thursday, January 10, 2019, 6 to 8 p.m. at the Grand Wayne Center in the Anthony Wayne Ballroom. Mayor Tom Henry today announced that 11 neighborhood associations are being awarded grants to improve their communities. This year, the Community Development Division launched the Neighborhood Improvement Grant program, which is designed to support neighborhood projects that beautify public spaces and strengthen community involvement. 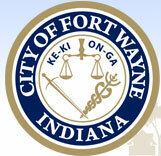 Work on a Fort Wayne public art master plan is now underway. The final step in creating a welcoming gateway into the downtown arts district is now complete. Today Mayor Tom Henry, local artists and neighborhood leaders cut the ribbon celebrating the completion of the Metaform sculpture and mural located in the 400 block of East Columbia Street, across from Three Rivers Apartments near the Columbia Avenue Bridge.